This game of Roulette is based on the French style of Roulette and played throughout Europe. The wheel has numbered pockets (partitions) ranging from 0 to 36. With only one zero and La Partage rule the house has the smallest advantage of just 2.63%. When the ball lands on the Zero and you have placed Even-Money bets, the La Partage rule applies (also called "en prison"). This means you only lose half of your Even-Money bet amount. This is very important rule that made French roulette to be the most favorable roulette game for players in terms of avarage payouts - the average payoff is the highest in this game. Inside Bets - when you place a bet on any number on the table from 0 to 36. Outside Bets - There are two different kinds of Outside Bets: Dozen and Even-Money Bets. This is when you place a bet outside of the table layout, such as Red or Passé 19 to 36. Call Bets - when you place a group of bets on the table using the Call Bets function in the casino software. 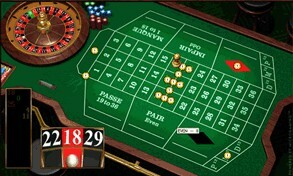 Players can place different types of bets on the table during a French Roulette game. However, each bet type has a maximum betting limit. The Gallic feel is immediately apparent from the crisp, clear and colourful graphics with titles like Manque (1 to 18), Impair (Odds), Passe (19 to 36) and Pair (even) in addition to a range of special wagers. To create the right ambience Microgaming has added high quality sound effects that capture the murmur of the crowd, the whir of the wheel and that distinctive metallic tinkle as the ball finds a hopefully lucky slot. In fact, French Roulette is a cutting edge update to a classic traditional European casino game still immensely popular in Europe. I hope you will enjoy the glamour and excitement of this table game. You can find the game at most of the Microgaming powered online casinos. Check out the real-time statistics on biggest French Roulette Winners.